The Apostle Paul tells us our new life in Christ is not some distant day after we leave this earthly body. It exists right here, right now. We need only to realize it. Yet, in the midst of the muck of every-day-living, I find ‘realizing it’ is often the hardest part. It is all too easy to be distracted from the reality of God at work among us, and focus instead on the brokenness, sickness and violence that seem to be abundant in our world. This is one reason I value the rituals of Holy Week and Easter. The Lenten Season that prepares us for Easter resurrection doesn’t end with Palm Sunday. It comes to a culmination on Maundy Thursday and Good Friday. 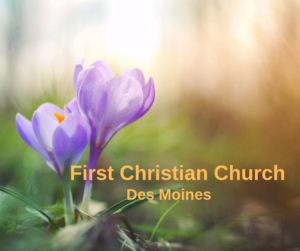 Palm Sunday, April 14 – worship at 10:30 am. Join us as we proclaim our belonging goes beyond ethnic lines and national borders. Good Friday, April 19 – service at 6:30 pm. This service reminds us that we stand in the shadow of the cross whose beams were built from hatred, violence and oppression. And in our remembering, we recognize not only our own accountability but we also behold the love and grace of God in Jesus Christ. Through Jesus’ self-giving love, our world experiences healing. “Easter is not just about Jesus; it is about you. He has already claimed his new life; now is your chance to claim yours.” I hope you will plan to participate in the Holy Week rituals. And I pray that by your participation, this Easter, you may more fully know the new life you already have in Christ.